1.1. Motorsportauctions.com is a trading name of Motorsport Auctions Ltd, company number 8524007, registered office c/o 35 Galileo Gardens, Cheltenham, GL51 0GA, UK. 1.4. All photographs loaded onto this website by advertisers must be copyright free or permission given by the photographer. www.motorsportauctions.com reserve the right to place a security watermark on any photographs displayed on the site. 1.5. You agree not to use this site to send or receive, upload or download, or in any way transmit or publish any material that is offensive, abusive, indecent, defamatory, obscene, or in breach of any person’s intellectual property rights or confidentiality. 1.6. Motorsportauctions.com does not assume any responsibility for the content of adverts on its website, the accuracy of the adverts, the nature or quality of any items or services described therein, or for any loss or damage caused by any error or omission in the publication or display of adverts. It is the sole and absolute responsibility of advertisers to check and satisfy themselves as to the content and accuracy of their adverts on placement and regularly thereafter. This is the case irrespective of whether assistance is provided by Motorsportauctions (by request or otherwise) in compiling, advising on or amending such adverts. Motorsportauctions.com bears no responsibility whatsoever for any such assistance or advice provided to advertisers or for any amendments made. 1.7. Respondents to	adverts are strongly recommended to carry out their own verification of the quality, and accuracy of any description, of items and services. 1.8. Motorsportauctions.com does not give any guarantee of volume or quality of response to adverts placed on this website. 1.9 Trade advertisers must clearly indicate that they are so, by selecting "Business Account" when registering. 1.10. Advertisers are asked to remove adverts immediately once the advert is no longer needed (e.g. item is sold), in order to help maintain the quality of this website and its usefulness for others, and to reduce unnecessary enquiries. 1.11. Motorsportauctions.com reserves the right to make any amendments it considers necessary or desirable to an advert and to require artwork or copy to be amended to meet its approval. 1.12. 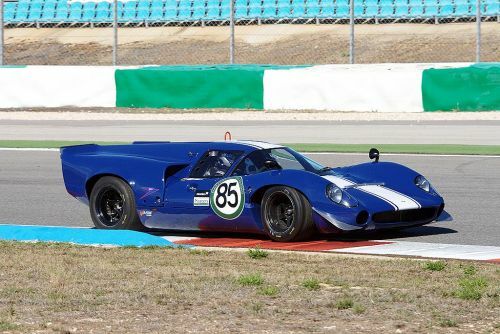 Motorsportauctions.com reserves the right to modify amalgamate separate and in any other way change the advertising categories it uses on its website where it deems appropriate. In such circumstances classified and display adverts will, where necessary, be moved into new or revised categories. 1.13. Motorsportauctions.com reserves the right to refuse or remove any advert that it considers unsuitable or inappropriate for this website or in circumstances where the advertiser has breached or alleged to have breached any of these Terms and Conditions. In such circumstances, where applicable to a paid advert, refunds will be given at the reasonable discretion of Motorsportauctions.com. For the avoidance of doubt, this includes refusal or removal of any advert which at its sole discretion Motorsportauctions.com considers competitive to its own business activities. 1.14. Motorsportauctions.com reserves the right to publish any part of any adverts placed within its website within any of its marketing or promotional activities. The exact format and content of adverts published within Motorsportauctions.com' marketing or promotional activities will be at the discretion of Motorsportauctions.com and, whilst Motorsportauctions.com will exercise due care to ensure the content is error free, but cannot be held responsible for any errors or omissions in such activities. Classified Adverts will normally appear immediately the advert is placed and, where relevant payment made. In certain circumstances adverts may be referred to us prior to listing, in which case we will endeavour to respond within one normal working day. Unless renewed,	Classified Adverts automatically expire at the end of their placement period, or when de-activated by you if earlier. They are saved within your account and may be re-activated at any time. Motorsportauctions.com reserves the right to move an advert to what it considers a more relevant category without notice. From time to time Motorsportauctions.com may offer advertisers the opportunity to have their advert(s) published elsewhere. The exact format and content of adverts published elsewhere will be at the discretion of Motorsportauctions.com and, whilst Motorsportauctions.com will exercise due care to ensure the content is error free, but cannot be held responsible for any errors or omissions in such advertising. We do not make a refund or provide credit in respect of any Standard or Feature Advert that is de-activated by you prior to the end of the period purchased. Currency conversion on classified adverts is provided purely for guidance only and Motorsportauctions.com gives no warrantee as to the accuracy of the conversion. Items and services are priced in the currency specified by the advertiser. As an advertiser we reserve the right to contact you about your advert when appropriate. This includes reminders to keep your advert up to date which we currently send monthly, and reminders when your advert is due to expire. We may also inform you by email if your advert expires. 2.2.1 Display Adverts are normally purchased on a monthly basis with payment by credit or debit card. They will continue until cancelled, which may be done by giving Motorsportauctions.com 14 days notice of cancellation, effective on the next monthly payment date. 2.2.2 Motorsportauctions.com reserves the right to modify amalgamate separate and in any other way change the structure of display advertising it carries on its website where it deems appropriate. For the avoidance of doubt, this includes changing the size specification and exact location of specific display advert categories. In the unlikely situation that such changes adversely affect an advertiser, Motorsportauctions.com will provide equivalent or better alternative advertising opportunities on its website, or provide a pro-rata refund. 2.3.3 Motorsportauctions.com has no access to or control over these cookies that are used by third-party advertisers. 2.3.5 If you wish to disable cookies, you may do so through your individual browser options. More detailed information about cookie management with specific web browsers can be found at the browsers' respective websites.